1. Write one importance of milk. 2. What is the function of oxytocin hormone? 4. Enlist the methods of milking. 5. Enlist any two milk products. 6. Write the full form of SNF. 7. What is the importance of milk collection centre in dairy industry? 10. What is the full form of HTST? 12. Name the enzyme used for cheese making. 13. Write the full form of NDDB. 14. What are the factors to be considered in clean milk production? 15. Write the advantages of pasteurization of milk. 16. Write the procedure of clot on boiling test of milk. 17. Briefly explain the payment system of milk based on volume. 18. Write the objectives of packaging of processed milk. 19. Enlist the platform tests performed after receiving the milk. 20. Enlist the materials required for 'Khoa making'. 21. Enlist the factors affecting composition of milk. Describe any two. 22. Draw a well labeled diagram of mammary gland. 23. Write the importance of scope of dairy sector in Nepal. 24. Write the principle, materials required and procedure of fat test of milk. 25. Define pasteurization. Describe continuous method of pasteurization of milk. 26. Enlist the materials required for 'paneer making' and describe its procedure. 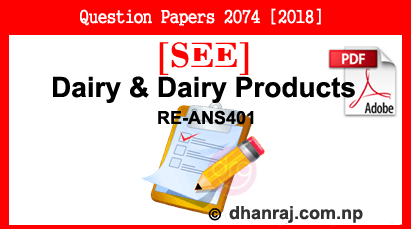 0 Response to "Dairy and Dairy Products | Exam Paper | 2074  | RE-ANS401 | SEE"